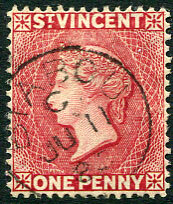 (PML.4) in red ink on 1873 QV 1/- lilac-rose (SG.20, Cat.£350) with tear at base from the mysterious band of use somewhere within the life of the later QV 1/- claret (SG.21) pmk'd red ink PML.4 period NO 28 1875 to DE 28 1876. 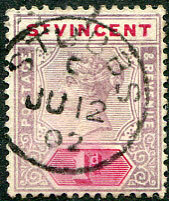 The 1875 QV 1/- claret (SG.21, in use for approx. 17 months) is pmk’d at Kingstown firstly by black horiz. 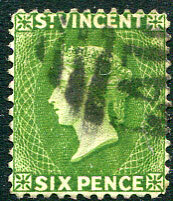 “A10” (PML.4), secondly by red ST. VINCENT cds, and thirdly by red horiz. “A10” (PML.4). 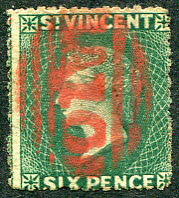 The black PML.4 band stretches from JU 27 1872 (cover) to JU 24 1875 (red village “CH” overstruck black “A10”), the red ST. VINCENT band being JY 10 1875 to NO 9 1875 (covers), and the red PML.4 band being NO 28 1875 to DE 28 1876 (covers) giving way to the first 1/- vermilion (SG.24) cover of FE 28 1877 with continued cancelling by red PML.4. 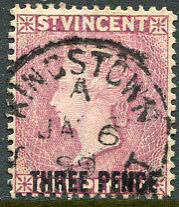 The last two bands might have been extended by loose village pmk’d stamps but when Kingstown switched to the red ink pad the overstriking was abandoned as the GPO did not want red overstruck red. 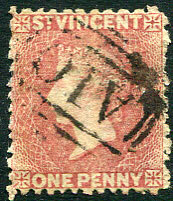 (During the red PML.4 band covers to other BWI islands and the USA are found cancelled by red ST. VINCENT cds). 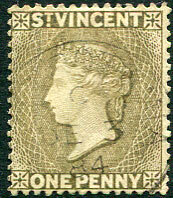 (PML.4) in black on 1873 QV 1/- lilac-rose (SG.20, Cat.£350) piece. Ex FORSYTH. 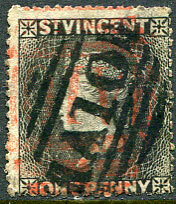 The black PML.4 band stretches from JU 27 1872 (cover) to JU 24 1875 (red village “CH” overstruck black horiz. “A10”). 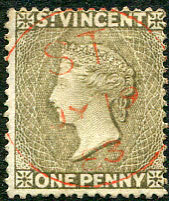 (PML.2) on 1881 QV 1d drab (SG.37). 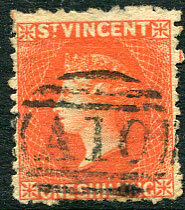 (PML.2) on 1881 QV ½d orange (SG.36). 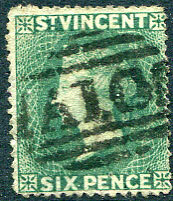 (PML.4) on 1873 QV 6d dull blue-green s/ways star wmk (SG.19, Cat.£50), fine used. 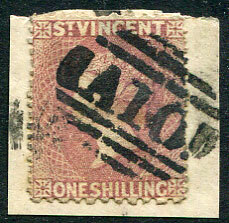 (PML.4) on 1872 1/- deep rose-red (SG.17, Cat.£140), fine used with marginal lines wmk along base. 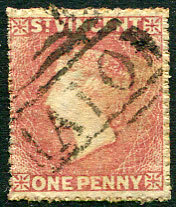 (PML.1) on 1861 QV 1d rose-red (SG.1), fine used. 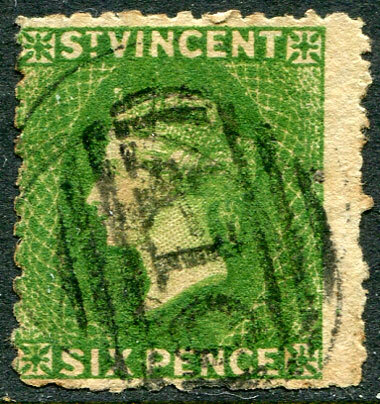 (PML.1) on 1862 QV 6d deep green (SG.4), fine used. 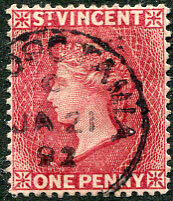 C/NO 11 89 on QV 1d red (SG.48b). 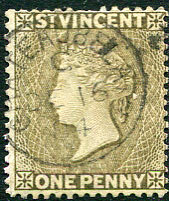 C/SP 5 86 on QV 1d rose (SG.48a). 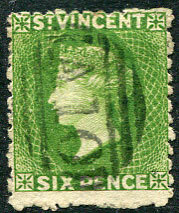 (PML.1) on 1861 QV 6d deep yellow-green (SG.2, Cat.£200), fine used. 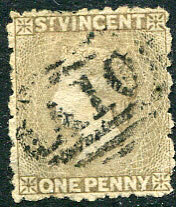 (PML.3) on 1866 QV 1/- slate-grey P.14 to 16 (SG.9, Cat.£140), very fine used. 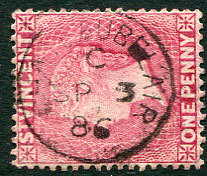 (PML.3) on 1862-68 QV 1d rose-red P.11 to 12½ (SG. 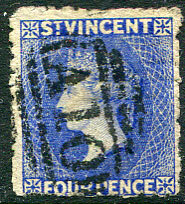 ), fine used. 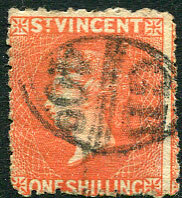 (PML.2) on QV 1/- bright vermilion P.11 to 12½ (SG.31, Cat.£60), fine used. 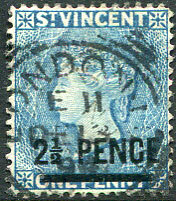 (PML.2) on 1881 QV 4d bright blue (SG.38, Cat.£120), fine used. 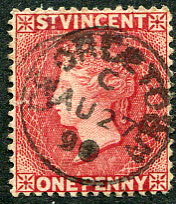 C/MY 3 88 on QV 1d red (SG.48b). 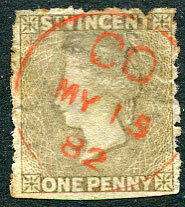 C/MY 2 88 on QV 1d red (SG.48b). Currently recorded period C/AP 9 88 to C/JA 15 96. 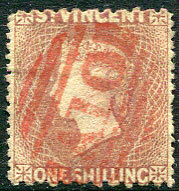 C/JU 11 85 on QV 1d red REVERSED CA wmk (SG.48x). 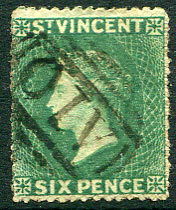 (PML.7) on 1883 QV 6d green P.12 (SG.44, Cat.£300). 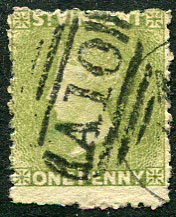 dated C/DE 16 84 on QV 1d drab (SG.39). Currently recorded C/AP 22 84 to C/FE 21 85 on QV 1d drab. 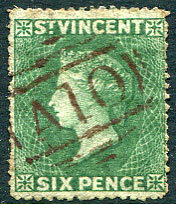 dated C/DE 3 84 on QV 1d drab (SG.39). Currently recorded C/AP 24 84 to C/FE 20 85 on QV 1d drab but finely struck examples rarely found. 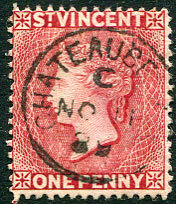 dated C/OC 24 90 on 1889 QV 1d carmine-red (SG.48c) showing "cut-throat" plate variety. 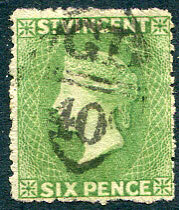 This village cds seldom found on this printing. 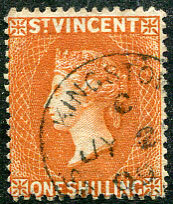 (PML.7) on 1883 QV 1/- orange P.12 (SG.45, Cat.£60), full perfs. 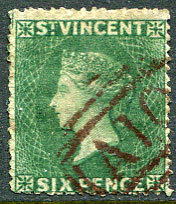 (PML.2) on 1880 QV 6d bright green (SG.30, Cat.£70). 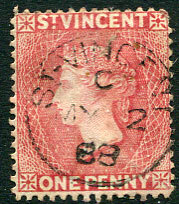 in red dated MY 15 82 on QV 1d drab (SG.37), shallow thinning below hinge with nick into design top right and str. edge at base. 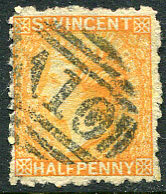 (25mm) dated C/SP 27 01 on QV 4d yellow (SG.56). 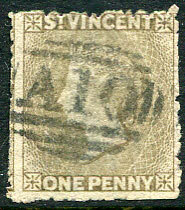 New ERD dated A/JA 3 99 on QV 1d red (SG.48b). 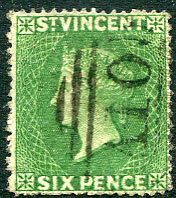 The previous gap between code letters was C/DE 23 98 and A/JA 6 99 (both as reported by West Indies Postal History Review by Joe Chin Aleong). 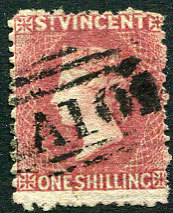 The "A" code had a short life on QV 1d red, current last date being A/AP 18 99, and strikes on the QV 1d red are not as plentiful as one might expect. Black ink Edinburgh JA 13 77 arrival "killing" lightly pmk'd red horiz. 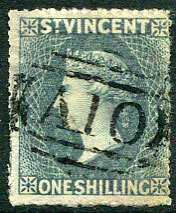 "A10" on QV 6d deep blue-green (SG.19b, Cat.£50). Dated arrivals rarely found for this period (useful for confirming precise date of a Head Office killer). 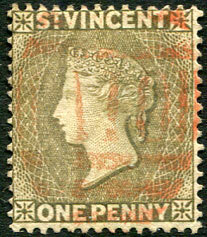 (PML.1) fine impression on 1861 QV 1d rose-red (SG.1). 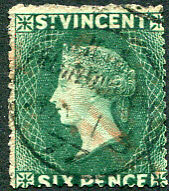 (PML.4) in red on 1875 QV 6d deep blue-green (SG.19b, Cat.£50). 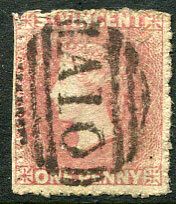 C/AU 27 90 on QV 1d carmine-red (SG.48c), tiny tear middle left side. 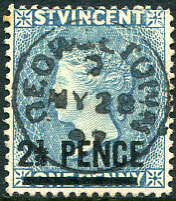 C/JU 12 02 on QV 1d Keyplate (SG.68). 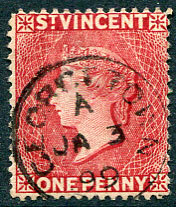 C/JA 21 92 on QV 1d carmine-red (SG.48c). 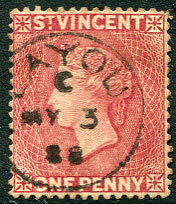 in red dated JY 19 83 on QV 1d drab (SG.39).